anne*design*collection has no other items for sale. Beautiful, very nicely packaged and added free gift!!! Highly recommend. Beautiful sewn, wrapped, and sent!!! China's loss product is my gain. 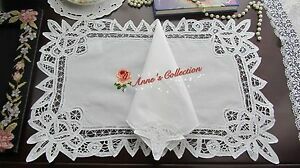 These place mats and napkins are absolutely elegant.